As a designer, I have always had a handful of small ‘secret’ goals. Although I don’t think I ever told her, one of my wish-list items was for my friend Rachel from The Power Room to hold my flowers! So when she reached out asking me to design a bouquet for a shoot, where she would be modeling, I squealed. Dreams do come true! 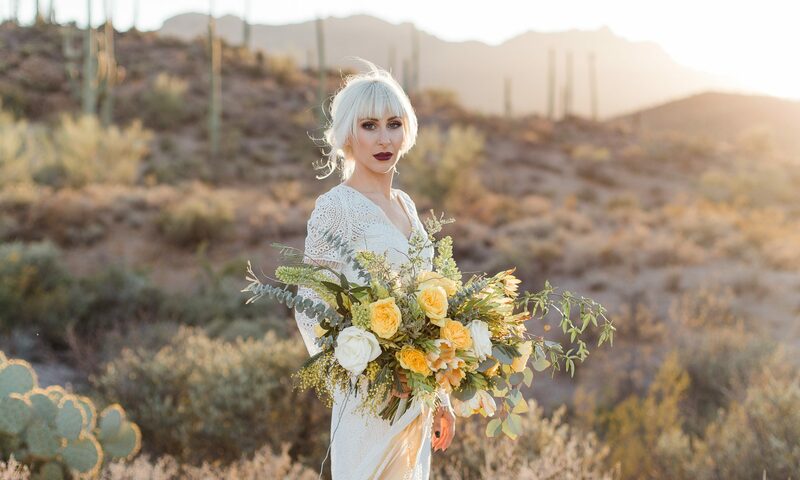 Rachel teamed up with Hannah Elizabeth, a photographer visiting from the U.K., to style a boho-inspired desert shoot showcasing a new bridal gown designer launching in the U.K., Shikoba Bride. Look how dreamy the results were! I’ll confess: I was nervous when they gave me creative freedom to design anything I wanted for this project. No style specifications, no color palate. I knew I wanted to highlight the beauty of the Tucson desert without overpowering it, and I also wanted to work with a more unusual color palate. I considered the sharp lines of the saguaros, the rough landscape, golden hour light, muted tones, and what local materials I would have access to. I landed on yellow, a color palate that I was intimidated to design with, but I hit it head on. How incredible are the design details on this gown?! Hannah Elizabeth packed this Shikoba Bride dress in her suitcase across the ocean and across the US! What a treat to do a shoot with them. Love this change of looks – different light as the sun set behind the desert hills, and a few wardrobe accessories. It doesn’t change much to change the whole feel! Just for fun, here are a few behind the scenes shots! Sometimes, a single bloom can have the biggest impact. I really enjoyed soaking in these beauties over the next few days after the shoot. Too much coral for the camera to handle. Excited for it to be warm enough to bust out my spring work coat, and for the endless piles of bright spring blooms. I’m ridiculously blessed to work where I do. I mean, just look at this. (Check our #srvflowerhoopla for more pretty pics!). Whenever overwhelm and fear start to slink in, I try to stop and look at what God has provided... and one of the biggest things is a job that allows me to work with my hands, work with my brain, and do it all while surrounded by beautiful flowers and beautiful people. It’s Coral Charm season. Maybe one day I will tire of them... but today is not that day. What a delight. Thankful for my own personal “white way of delight” this spring. Making the treck to DC, parking, and battling the crowds to see the tidal basin blooms just didn’t feel doable, but I sure have been enjoying the massive cherry trees along the driveway! A whole lotta coral from the #srvflowerhoopla last week!